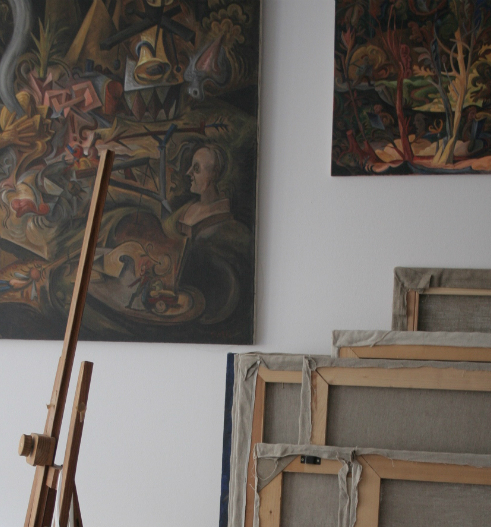 In his works, Michal Tomek focuses on themes with multiple layers and meanings. Portrayed are fantastical landscapes full of labyrinths, gates, or deserted bunkers. Landscapes, in which architecture merges with the human body. Archetypal figures of a hermit, puppeteer, tightrope walker, Trojan horse, or a dog unshackled from its chain all appear in his paintings. Michal Tomek expresses himself through perfectly executed classical techniques. In his paintings, watercolours, and graphics, one can observe complex philosophical, religious, and psychological themes manifesting as mirrors of immediate presence. We are presented with a form of art that is original in the true sense of the word, standing outside the boundaries of current trends and artistic fashion. Michal Tomek thus represents a unique and distinguished figure in the field of contemporary Czech art.